On this page, you will learn how to restore photos that were accidentally deleted from your device. Each of us at least once faced with such a problem – this usually happens when an unsuccessful attempt to clear the memory of your smartphone or tablet. Fortunately, to overcome this situation, there are special programs (applications) with the help of which you can restore deleted data. Today we review best apps for Android to get your deleted photos back! DiskDigger is a powerful application designed to recover deleted folders and files on Android phones and tablets. It works both with internal memory and with micro-CD cards. To work, you need to recover deleted photos and videos in good quality – you need to have Ruth rights to view. If you do not have them and want to get data without rights, then DiskDigger necessarily needs basic functionality, which is enough to restore deleted themes and pictures, but it is possible that the quality deteriorates because images are restored from the cache of the phone. Select the needed section (for example, “Memory card”). Mark the files that you want to restore and click OK. Confirm the restoration of the files in the list that appears. In other words, if you accidentally delete photos from your phone or not accidentally and now regret it and do not know how to restore photos and video from the Android phone, it’s enough to install this program and after small program settings you can quickly restore deleted media files directly from your mobile phone without using another electronic friend – a computer! Everyone knows how the Trash works: the files you delete are not actually deleted but moved to another area of the physical disk. With the help of the Dumpster application, you can restore files on Android, like from the Trash, or delete them with a lack of free space. Dumpster works as a Trash on your computer Mac, Linux or Windows. Dumpster is an excellent tool for recovering files from the cloud backup (Dropbox, Google Drive, Microsoft OneDrive). It completely eliminates the need to create backup copies of your data constantly. Dumpster provides you the ability to recover erroneously deleted files, including images, video, audio pdf, zip, mp3, mp4, ppt, doc, avi, mpg, jpg, rar and many other types of files. Any file deleted by you will automatically fall into the Dumpster, from where you can always restore it. You can also permanently remove it before the time. The deleted files are stored in separate folders. You can select all or several files, share them on social networks, sort by date, size, type or name. Any deleted file can be viewed before recovery in the application itself, and if you have root rights, you can give Dumpster access to the root folders. Works without root rights, but if they are, then you will get even better performance. Does not require an internet connection. Restore Dumpster backups with one click. Preview the deleted photos, video and audio files before recovery. Send files to Dumpster using “share” or “send” using any file manager or gallery application on your device. Set the schedule for automatic cleaning of old deleted data. DigDeep is a powerful recovery tool that searches the internal memory of your device and the SD card for deleted images and easily restores them. Scan all folders and files. The time of the scanning depends on the memory capacity of your device. When the search is complete, you will see the folders on the screen, in each of them there are photos from a particular location. Check them one by one, in each folder, there is a list with all the photos in it, including those that are not deleted! Mark the images you want to restore. After that, a dialog box will appear, in which you will find the path for the recovered photos. You can find them either in this folder or in the gallery. Scanning internal and external memory (SD card). Pleasant and understandable user interface. Recover images of all formats: jpg, jpeg, png. The application for full scanning of the internal and external memory of Android. Recover Deleted Photos will help you recover all deleted photos and images quickly, free of charge and without the need for ROOT. Works on Android smartphones and tablets. Deleted Photo Recovery is an application that allows you to recover deleted images of various formats, including JPG, JPEG, PNG, etc. Just note that Deleted Photo Recovery does not require Root rights, what makes the program accessible to any user. And the simplicity and usability of the application are simply amazing: you just need to download it and the program will automatically scan the internal and external memory of the device and show all deleted images that can be recovered. Then the user only needs to go into the folder with the desired file and click on a single button to restore it. And thanks to the support of previewing images, you will never go wrong and will return only really necessary photos or pictures. Also in Deleted Photo Recovery, there is a section with detailed instructions for use. Note that the application has a stylish design in a pleasant color scheme. Recover Deleted Photos will make the restoration of photos confidently, as evidenced by the name of the app. This happened with many of us, did not it? The answer to these and other similar questions is simple – use especially “sharpened” for deleted or lost images program – Recover Deleted Photos! Thanks to it, you can quickly and efficiently restore deleted photos. Restore Image (Super Easy) is an excellent program for returning, in fact, photos, images on phones and tablets. Perhaps, it is one of the most popular solutions among recovery applications of this category. It has a simple and user-friendly interface, so working with this app will be quite easy. If you do not have root rights or you do not want to receive them but want to restore accidentally deleted photos, then this application is the best variant of all. Did you ever delete photos by mistake? This application will help to restore lost images in just two steps. 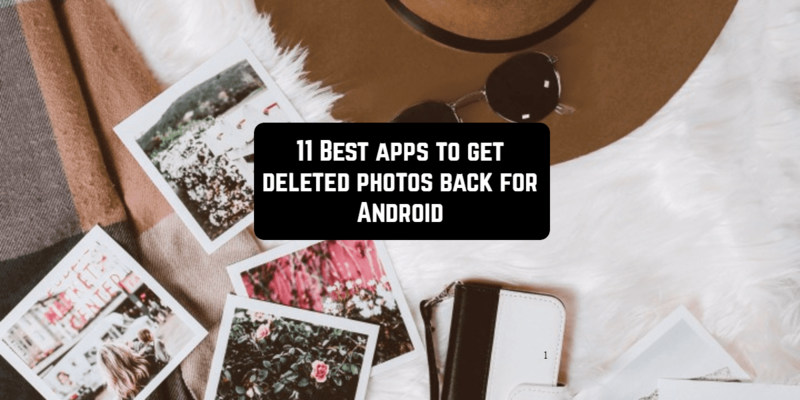 Step 1: Scan the lost and deleted photos on the Android application. Step 2: Select and restore important images. This app is a simple tool with support for most file systems and photo formats. File format: JPEG, PNG, TIFF, GIF, BMP, JPG, TIF. Photo Recovery is the application that searches for and restores deleted images, photos and other graphics on your Android phone and other mobile devices. Contains a step-by-step instruction, what greatly simplifies this routine process. Want to return accidentally deleted photos from your Android, or restore documents, messagWhatsAppsapp, and maybe – deleted contacts, but you do not have a computer near at hand? Then we will offer to you a new useful application for devices on Android OS – GT Recovery, which will easily restore the information deleted from Android gadgets! GT Recovery can recover lost files, photos, SMS, contacts, archive, music, video, installation kits, documents, etc. by scanning the amount of memory on your phone. The main functionality of GT Recovery is completely free. If you accidentally deleted something important on your phone, reformatted the memory card, or restored the phone to factory settings, GT Recovery can help you restore images or photos, audio, video, music, and records, recover lost contacts and messages, documents and files. Supports most formats, like FAT, EXT3, EXT4. The results of scanning audio or video can be viewed. The application scans and recovers deleted files and data from SD cards and internal phone memory. Works on Android with administrator rights and can come in handy when you accidentally deleted photos, videos or music. The main advantage of the application is that it allows you to preview most types of files. To unlock the full work (restore any files, delete ads and background scanning) – you will need to buy the full version. Recover deleted files from any partition. Finds documents, photos, videos, music, archives, and apk. Save the recovered files directly to Dropbox and Google Drive. Some files detected during the scan may not recover or be partially lost, as the data may be corrupted, just like on desktop PCs. There are many tools to help you to find deleted files on Android: applications, pictures, videos, PDF documents and other various information. And this post was about the best of them. But you should always try to prevent loss! Be careful, regularly make a backup according to the schedule of your applications, photos, videos, games, contacts, messages, calls, settings, bookmarks, calendar entries and so on. In real life quite often there are situations when it is necessary to view or edit a particular document, open an archive or get an access to the cloud storage. The abundance of different file formats that are used for electronic documents often forces you to use various programs to view their contents. Read our post about the best applications for viewing documents on Android and iOS.